How not to reveal your MySQL DB login/password when sharing code on GitHub or BitBucket? This trick also apply when you are writing report using knitR to create Sweave or markdown reports. Your password is stored in clear in your .my.cnf file. So as long as your file system is not compromised you are fairly safe. 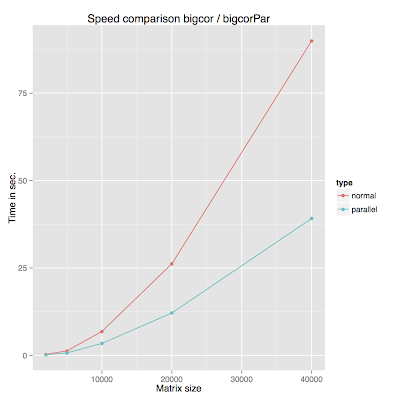 A little improvement to the bigcor function proposed on Rmazing to compute huge correlation matrix in R, I made the function work in parallel using all the CPU cores available on the machine. The code is here. 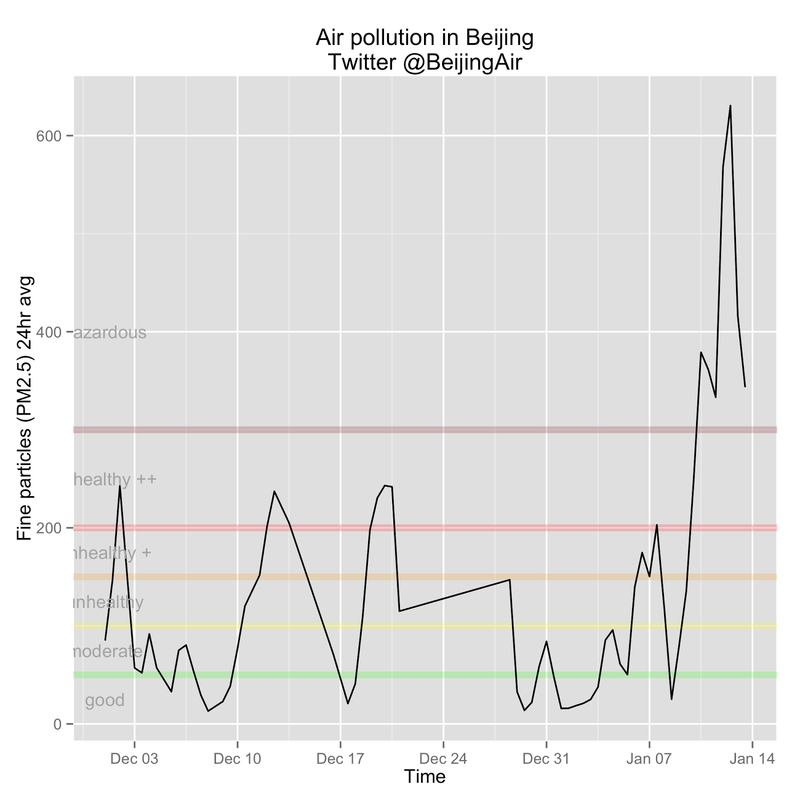 Air quality analysis from Beijing twitter feed. 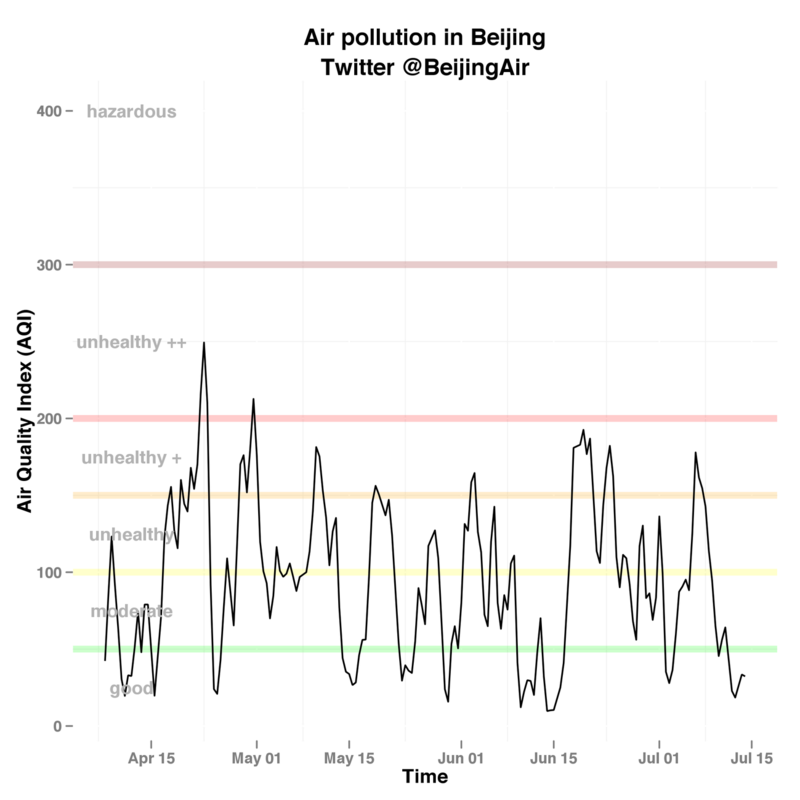 As air pollution in Beijing reach new high [NYT article]. I re-ran the analysis I put online a few months ago. "Crazy bad" is a good description when it reach those levels. But I am sure there are other place like Mexico city, LA etc... that also look as dramatic as those number for Beijing. The fact that the machine is tweeting make the analysis so easy. I hope it keep tweeting and that other place in the world do the same. The positive false discovery rate (pFDR) has become a classical procedure to test for false positive. It is one of my favourite because it rely on a re-sampling approach. I base my implementation on John Storey PNAS paper and the technical report he published with Rob Tibshirani while at Stanford [1-2] (I find the technical report much more didactic than the PNAS paper). pFDR ~= FDR ~= E[F]/E[S]. "[...] the pFDR can be written as Pr(feature i is truly null | feature i is significant)[...]"
In short this is a p-value for your p-value. Now let's compute the pFDR for a concrete example. Here, we will use a genome-wide gene expression study comparing two groups of patients (gene as row, patients as column). But the scenario can be applied to any type of data (SNPs, proteins, patient values...) as long as you have class labels. That said, it is a tiny bit idiotic to implement an FDR test for gene expression data as there are several R packages providing this functionality already but the aim here is to know how it works. 1. Because it relies on a random sampling procedure, results between runs will never exactly look the same. But increasing the number of random shuffling will generate more and more similar results. 2. It might be obvious to some but it is worth noting that if you do not have groups or an order in your columns (=samples) you will not be able to shuffle the labels and thus compute the FDR. From this small expression matrix of 2000 genes by 18 samples with two groups we will compute a p-value using a two-sided t-test. We obtained a vector of p-values that we will use to obtain the q-values. To do that, we need to evaluate the number of false positive (pFDR ~= E[F]/E[S]). We will achieve that by re-computing the p-value using shuffled class labels to see if just by random chance we can obtain lower p-values than with the original class label. The shuffling will re-label some ER+ samples as ER- and vice-versa. In a way, we aim at estimating the robustness of the p-value we obtained. Religious restrictions index: how do countries compare? The Guardian DataBlog published yesterday an interesting article exploring graphically the religious intolerance across the world. The data are coming from a report published by Pew Research Center's Forum on Religion and Public Life. I like the philosophy DataBlog a lot, providing the raw data for everyone to look at. However, I felt that the visualization could be improved. First the data are longitudinal and no temporal representation is provided. So I downloaded the Google Spreadsheet and worked it in R with googleVis. googleVis is the R API to the Google graphic library. I like it better to explore those data. Select a country of interest and follow it. 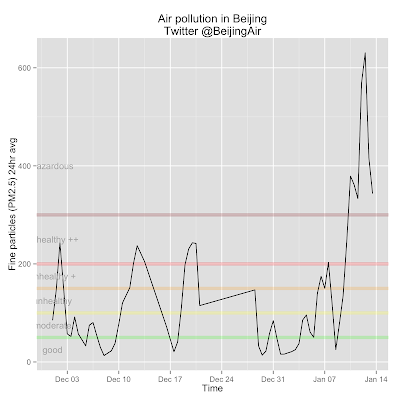 Next will be to compare the pollution level between different cities such as LA and Beijing. 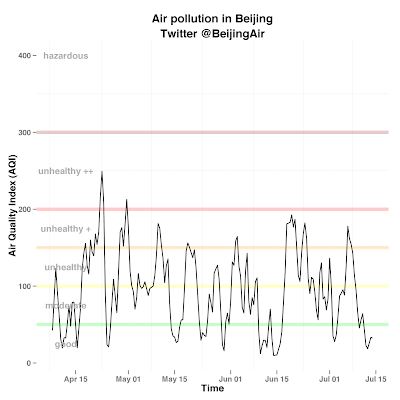 But it turns out the air quality data for California are not so easy to get programmatically.